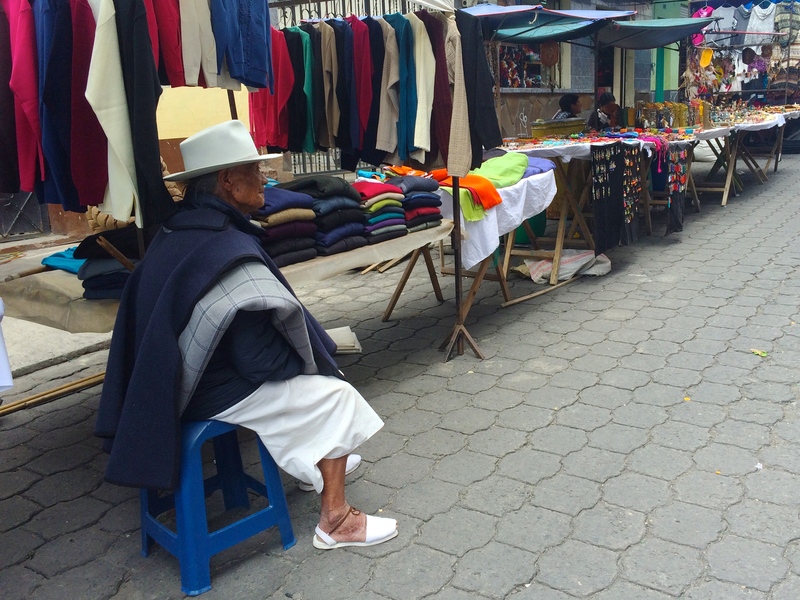 We bid farewell to the historic center of Quito on Saturday morning as we headed out for Otavalo at 8am. It was an easy 40-minute 25¢ trolly ride from Santo Domingo to El Ejido to Terminal Norte. 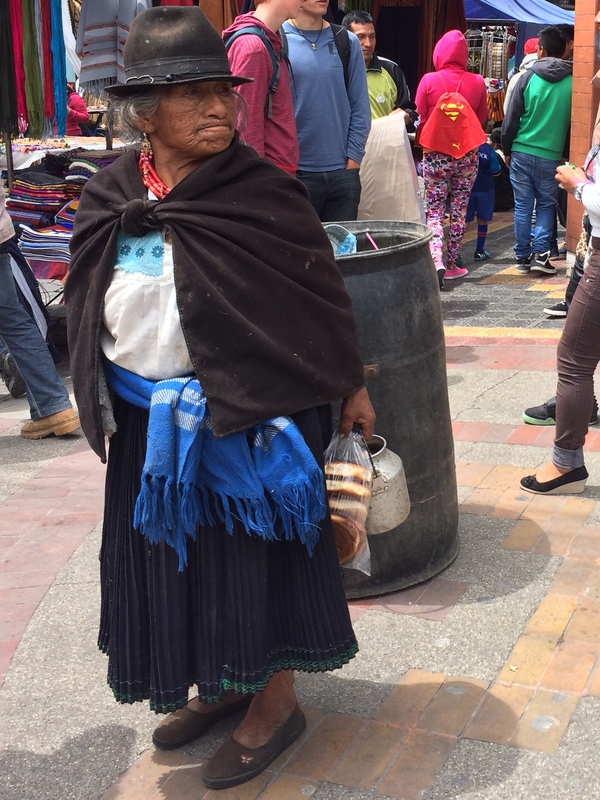 However, Terminal Norte was insanely packed with locals and tourists queuing up for buses for Otavalo. 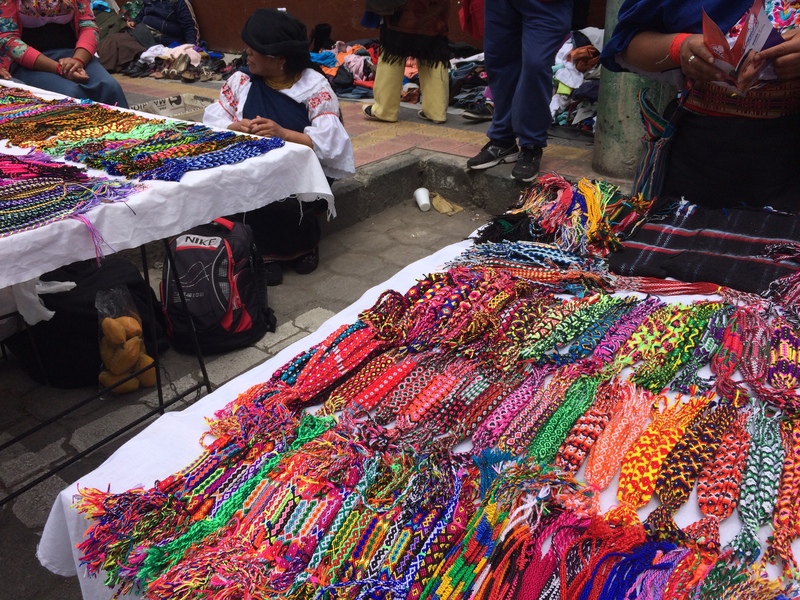 Fortunately the long line moved along quickly, we paid $2.50 each for our bus tickets, and we were on our way to Otavalo by 9:30am. Exactly two hours later we arrived to the main bus terminal in a very lively Otavalo. 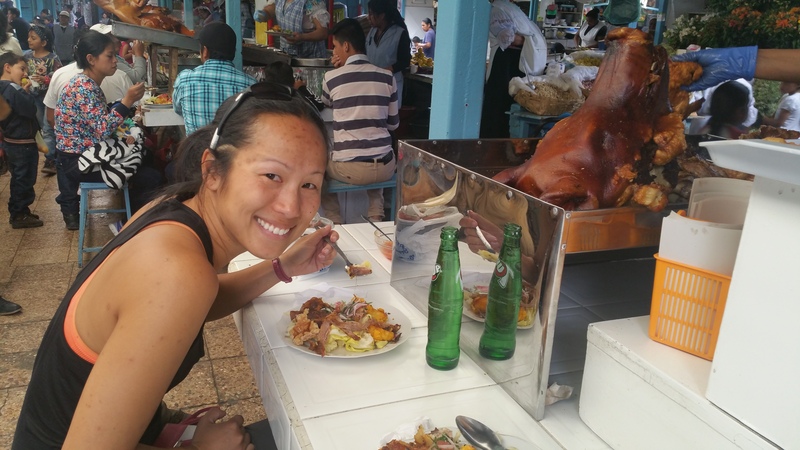 We didn’t have to walk far to find streets filled with hostels and we quickly checked into a hostel run by a family of native Otavalos for $9 per person per night. (It was $7 per person for a room with shared bath, but we wanted to splurge for a private bathroom. Ha!) 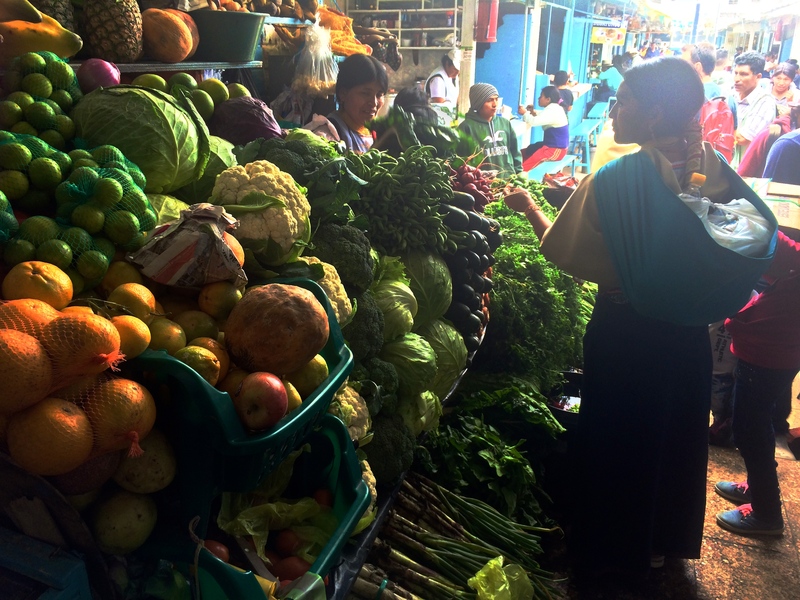 After dropping our bags, we ventured out into the bustling streets toward the famous Saturday market. 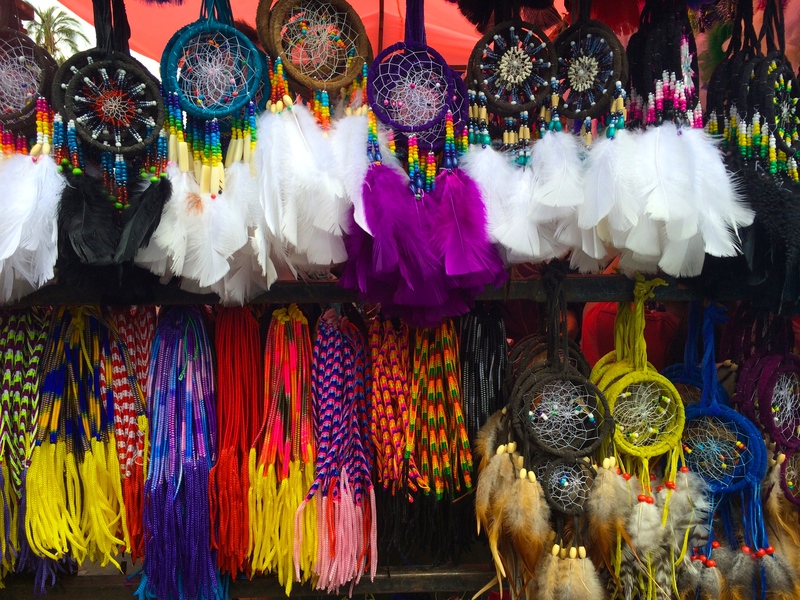 This region of Ecuador has an indigenous population known for their handicrafts and Andean folk music. 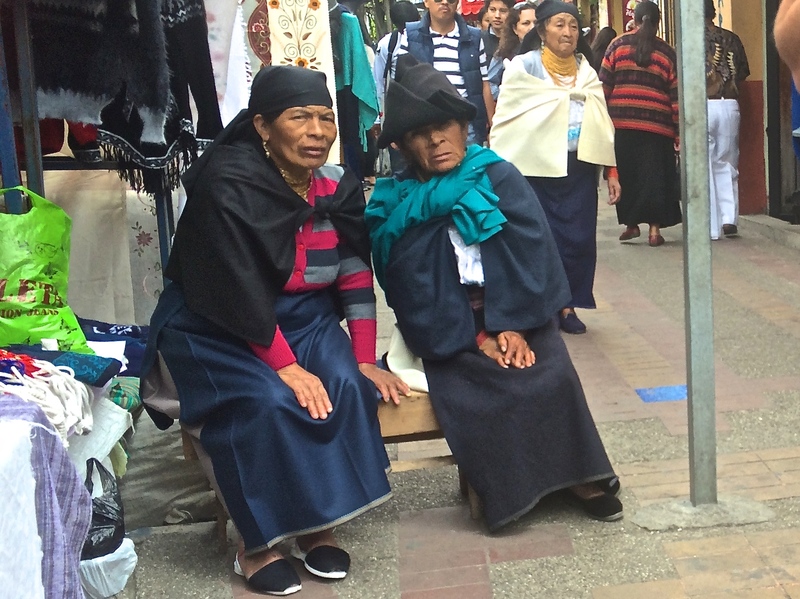 The Otavalos can easily be recognized by their traditional dress; men are typically in white pants with a dark poncho, and women are typically in a dark skirt, colorful waist band, and white blouse with colorful embroidery. Both men and women wear their hair long, with the men’s hair typically in a single braid. All throughout the streets we watched the locals carrying out their typical Saturday morning. 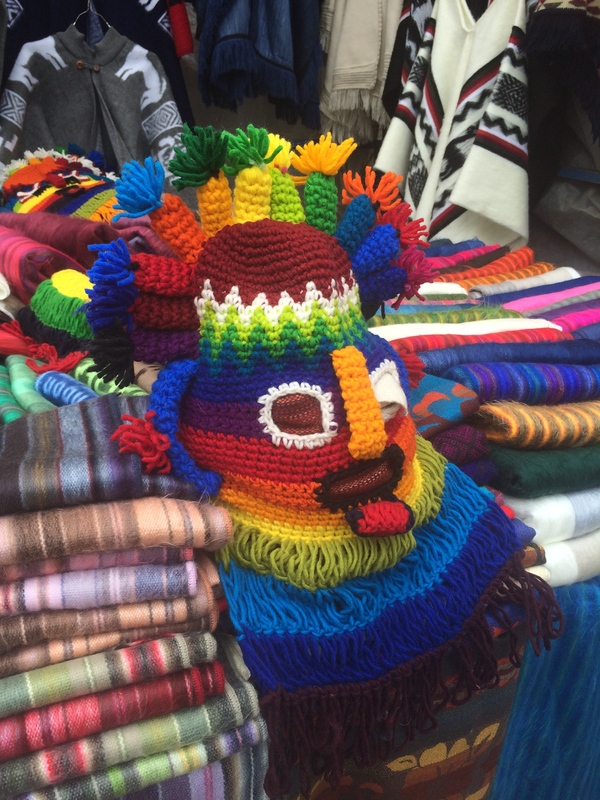 My favorite knitted mask that could be found everywhere was a mask of the god Inti, one of the most regarded deities of Inca religion. Noon soon approached and we found ourselves in the produce market. 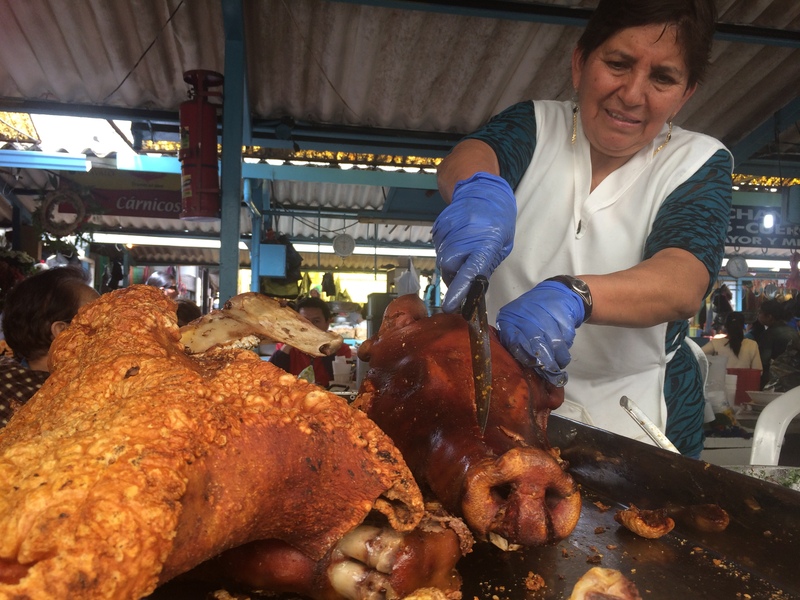 Not far from the produce stands were the food stalls, crowded with hungry locals chowing down on lunch. 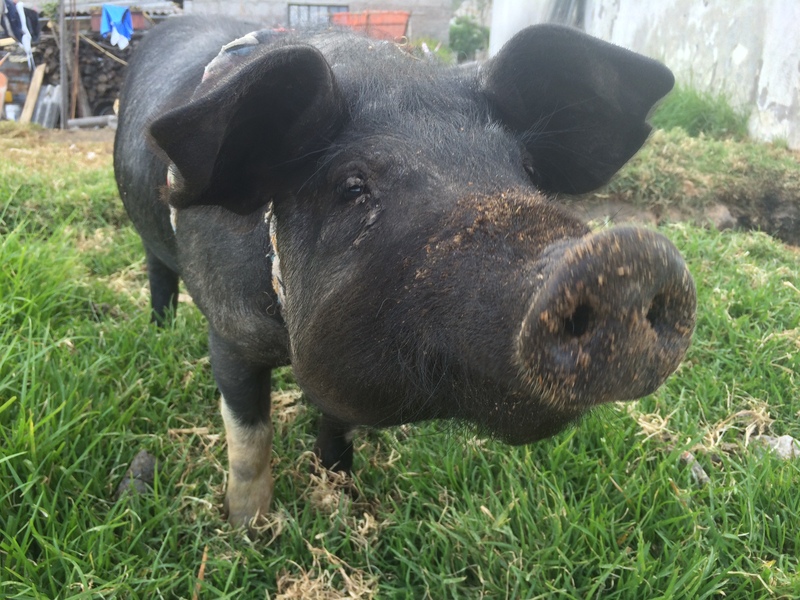 The roast pork was amazing. 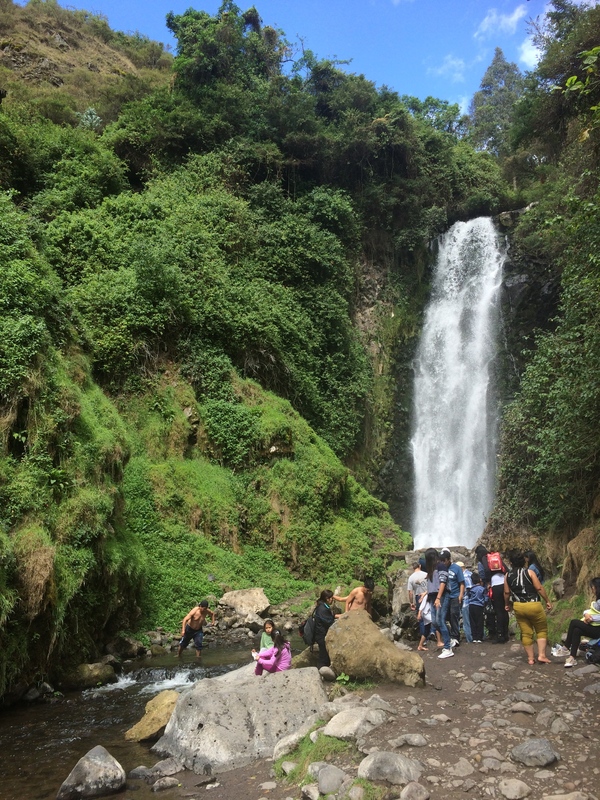 After lunch we walked several kilometers north to the outskirts of Otavalo to the cascada de Peguche, or Peguche waterfall. Apparently the Otavalos take ritual baths here during important ceremonies and festivals. Because it was a Saturday it was popular with locals. 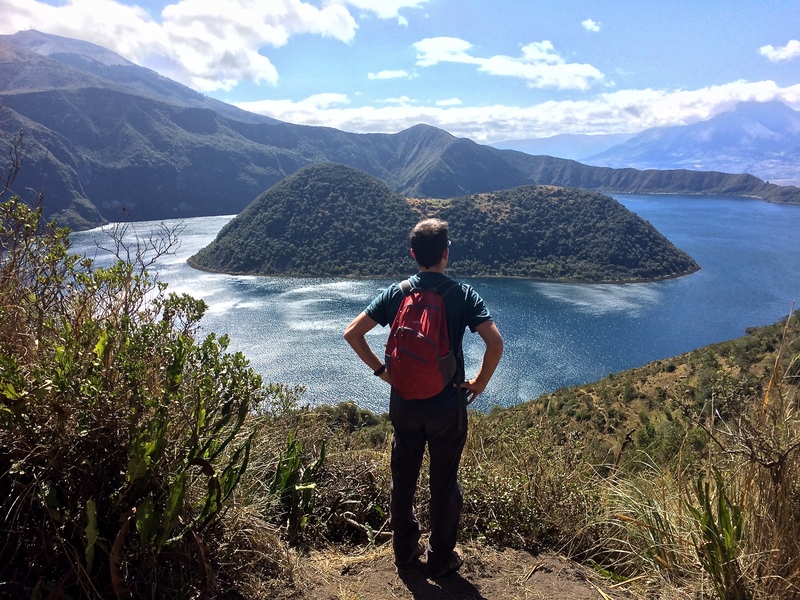 We then proceeded to hike beyond the waterfall, up and over the mirador to the other side of the hill toward Lago San Pablo. Along the way we walked by several villagers and their livestock. 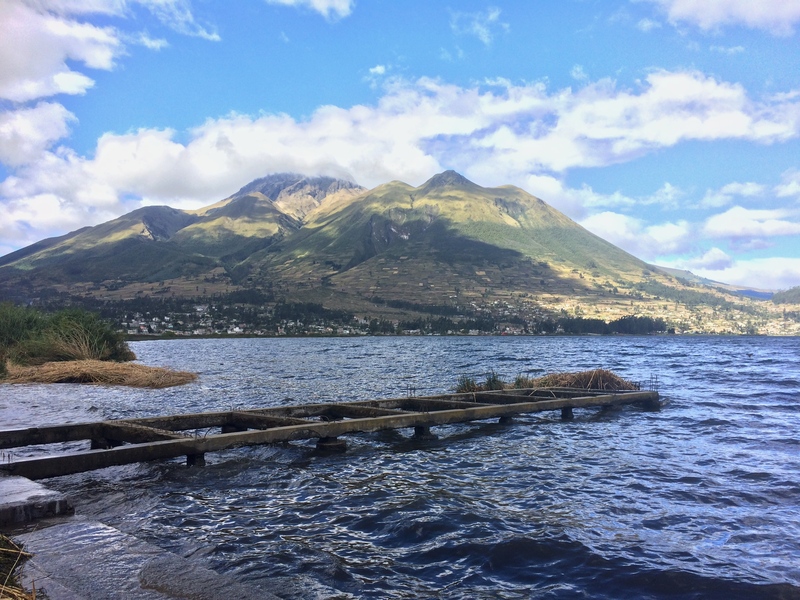 Lago San Pablo, with Imbabura Mountain in the distance. 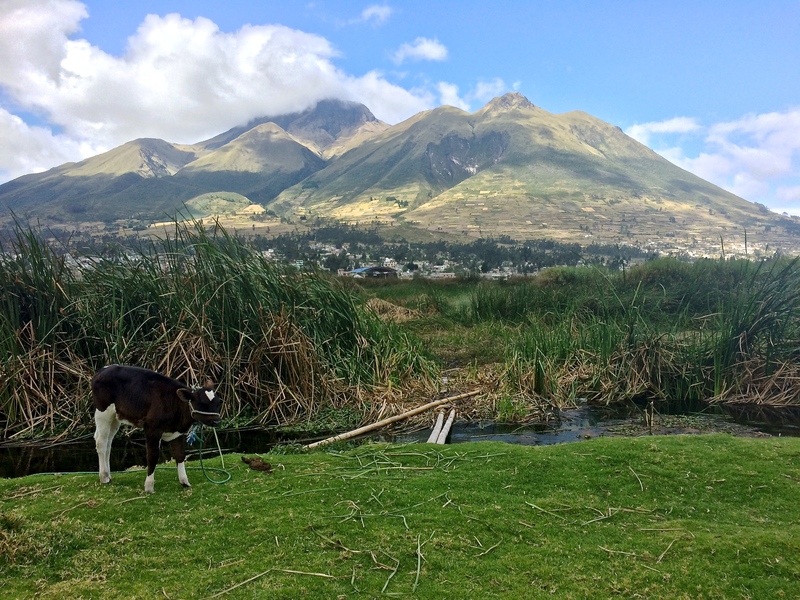 Imbabura is one of the highest mountains in Ecuador at 4,630 meters. Feeling lazy, we took the bus back to Otavalo. Fortunately there was a bus stop right across the street from Lago San Pablo. 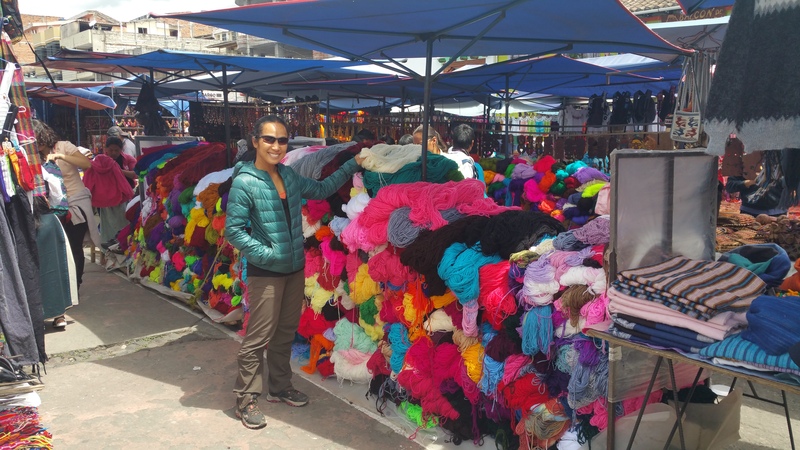 Day 1 from Quito to Otavalo, to the market, to Peguche waterfall, and to Lago San Pablo was delightful. Day 2 was equally as stunning, if not more. By 8:20am we got ourselves on a bus heading toward the town of Cotacachi for 35¢. 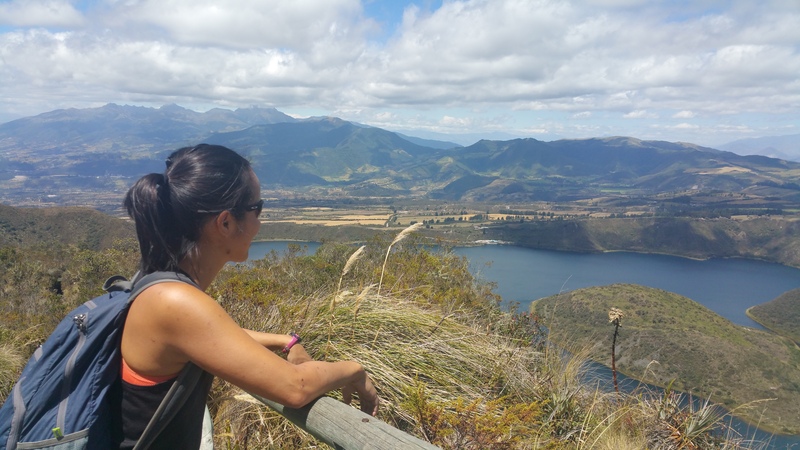 We got off at the town of Quiroga and shared a taxi with 2 other tourists to Laguna Cuicocha for $4. 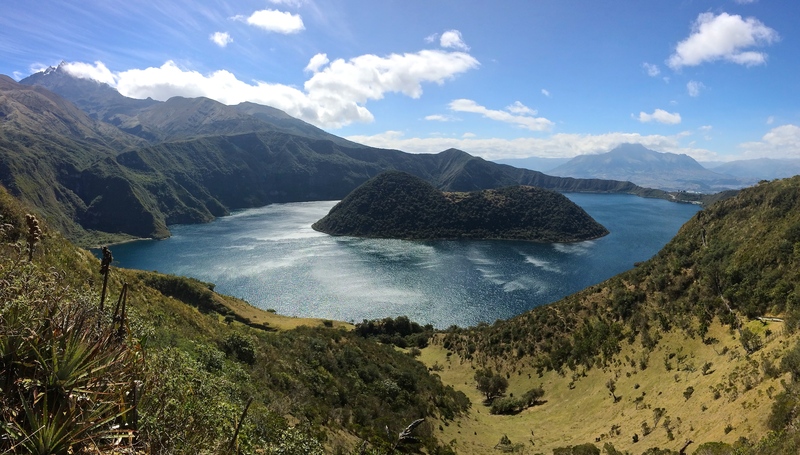 Approximately 10-15 minutes later we were dropped off along the breathtaking Laguna Cuicocha, a volcanic crater now filled with a lake. We began our hike at exactly 9am, which made the total travel time of bus and taxi only 40 minutes. Luck was also in our hands, as the weather couldn’t have been more perfect for a hike around the crater. Unlike most people, we opted to hike the laguna clockwise, which meant we had to walk up the paved road an additional 3.5 km. There was a large sign clearly indicating the end of the trail and not to enter, but we along with a group of locals started from the end anyway. Because the trail was so narrow, we ended up being glad that we traveled in this direction; it was more secluded which meant we didn’t have to wait for struggling hikers ahead of us. As the sun rose higher, the day grew later, and we made our way toward the entrance of the hike. It was a weekend and it became evident that the later the day, the more people there were. I highly recommend hiking earlier in the day, and/or starting from the end of the trail to avoid large crowds. The hike around the rim was perfect–not too long and not too short with a distance of approximately 14 km which took us just under 3.5 hours. It peaked out at ~3,450 meters at its highest point. 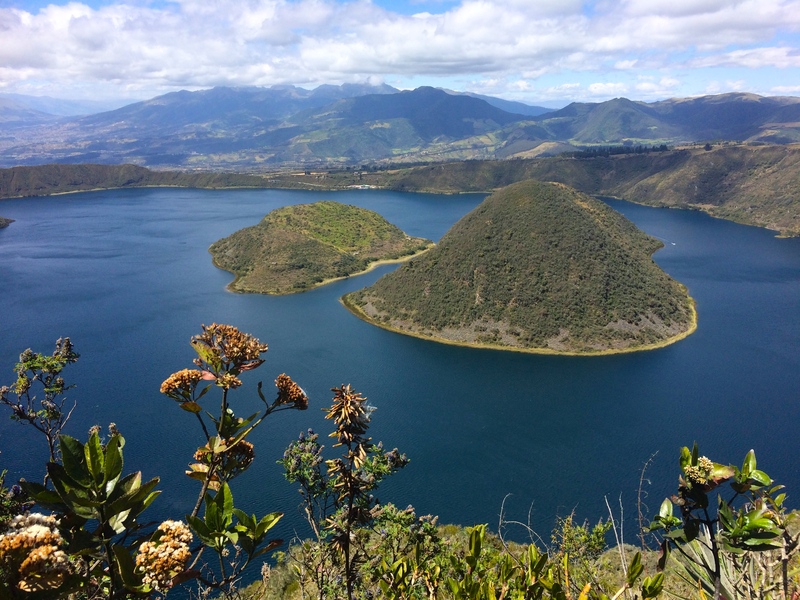 Unlike Laguna Quilotoa, what made circumnavigating the rim of Laguna Cuicocha more interesting were the two islands in the form of three domes of volcanic rock in the center. The island as seen above is nicknamed “Cuy” or guinea pig, because it looks like one! The further and higher we walked, the more we circled around the islands, and the more the views changed. We were even able to see the skinny water channel between the two islands, which boats can navigate through. 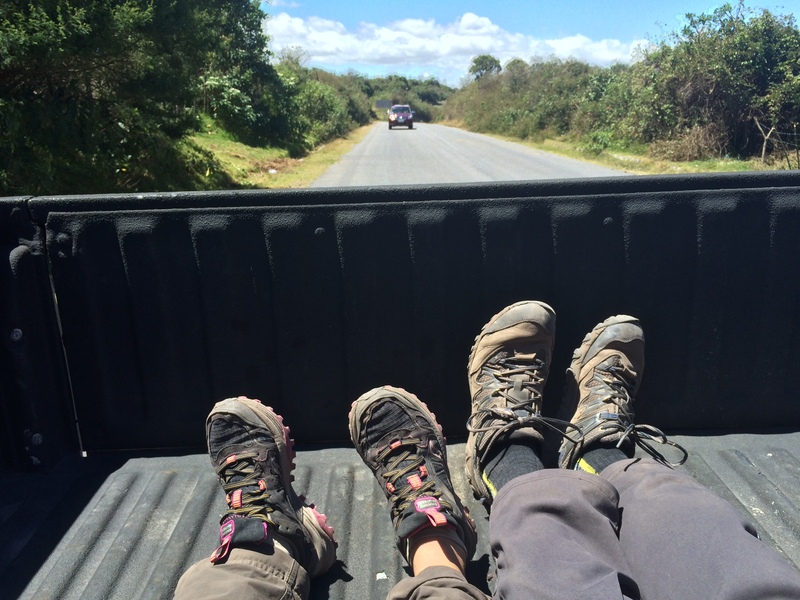 We found ourselves in the parking lot at exactly 12:30pm and within a minute we were able to hitch a ride on the back of a local’s pickup truck returning to Quiroga. Nguyening! 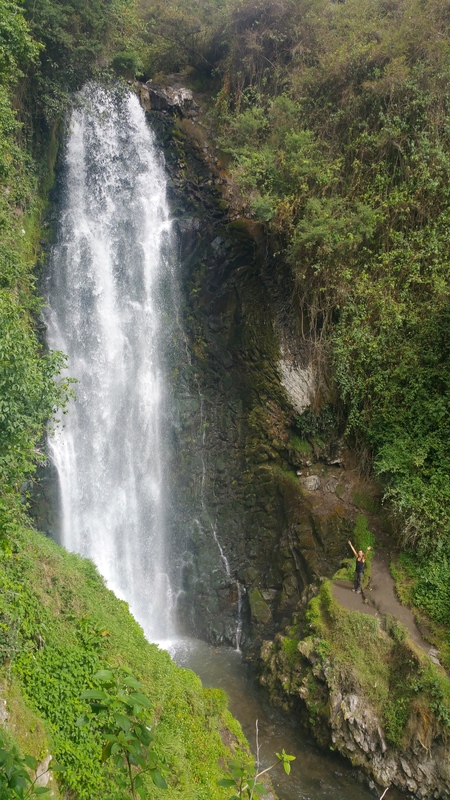 Our final days in Ecuador were wonderfully spent: we strolled through the most famous market in the country, and we satisfied our thirst for the outdoors by hiking to the waterfall and hiking around the beautiful rim of a caldera. It was now time to wrap up our incredible 5 months in South America and finish with one more fascinating country in the Caribbean prior to going home. 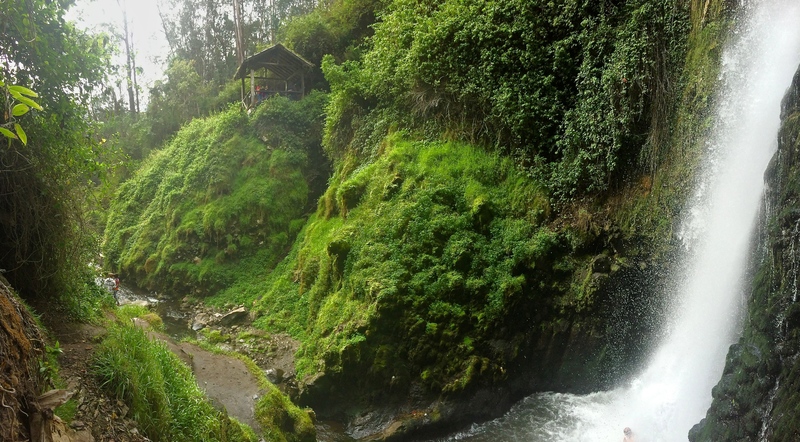 This entry was posted in Ecuador and tagged cascada de peguche, lago san pablo, laguna cuicocha, otavalo market. Bookmark the permalink.